~ Sigourney Weaver, IGN, 2005. ~ Ridley Scott, The Latino Review, 2002. In 2003 Ian Nathan interviewed Scott for The Times to celebrate the release of the Alien Quardilogy, and Nathan noted that he didn’t “even seem to want to recognise that two more films were made” after the second movie, which may have been a cause of consternation for Scott and Fox. This is conjecture, of course, but Scott’s unwillingness to heed the latter films (“One was set on a prison, wasn’t it?” he asked Empire in 2012) may have been a stumbling block for cracking the fifth film’s story. Ridley always spoke about exploring the Space Jockey and the concept of biological warfare, and he may not have been ready to weld it to Ripley’s clone and a film that he never held in much regard. ~ James Cameron, BBC One interview, 2003. In 2004, Ridley spoke with Japanese publication Famitsu Wave about Alien 5. and indicated that it was still in everyone’s minds, but would not be greenlit until Fox saw how succesful the spin-off movie would be. He spoke cryptically about the plot and whether or not he would direct it. Famitsu Wave: And what of the rumor of another Alien movie? FW: With you as director? RS: I don’t think I’ll be directing, but I will have some involvement. It’ll probably be based on an idea I have, so I hope I’m asked to be involved. FW: Can you talk about the idea? RS: In broad terms, it’s something for those folks that want to see Ripley’s journey come full circle. FW: Does that take her to the home planet of the Aliens? After the release of AvP director Paul W. Anderson was briefly rumoured to be helming the fifth Alien installment: hearsay that he quickly shot down. “That’s not a reality,” he said. “I’ve heard that. I’ve been doing press lately for AvP and a lot of people said that. I don’t know where that came from. It’s not something I’ve been approached about.” His choice for Alien 5‘s director? Ironically, James Cameron. AvP may have caused him to lose interest in making a new movie in the series, but Cameron still got around to seeing it.”I think of the five Alien films, I’d rate it third,” he diplomatically said of Anderson’s film, which is no real feat considering his opinion of the third and fourth movie. Ridley however couldn’t bring himself to see it or its 2007 sequel. Empire: I’ve always wondered, did you see the Alien vs. Predator movies? Empire: (laughs) They don’t exist. Ridley: I couldn’t do that (laughs) I couldn’t quite take that step. ~ Empire Online, Prometheus: The Interviews, 2012. Have to say…I like something closer to Scott and Cameron’s way of thinking, not AVP. Sorry. And thanks for pulling this together! His Alien 4 is not the best script, but by Jeunet it was treated awfully. In general, Joss Whedon should direct what he writes, since the director’s interpretation of several scenes and the direction in general was just horrible, it created a campy atmosphere which was not Whedon’t intention at all. 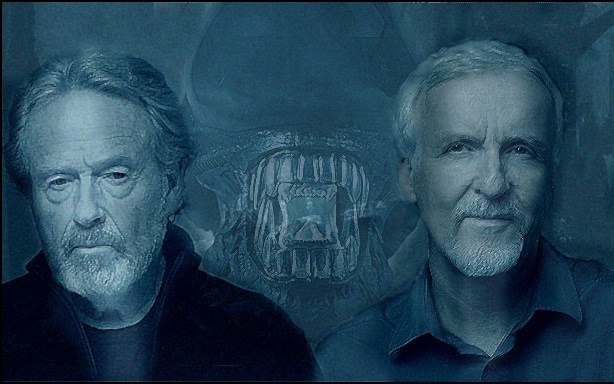 With all the talk of a new Alien film, this is a great look back at the various directions the series could have gone in, were it not for Director and Studio hubris. Part of the beauty of the original “Alien” were the relatively unknown character actors who were cast. Having Schwarzenegger or Cage in an “Alien” film would be too Hollywood. It should be acknowledged that the studio or Giler/Hill need to take responsibility for the franchise failings and not director and writers, they are what Lucas is to Star Wars that steers and dictates the overall vision, and as we know the latter is in very rude health after Lucas relinquished the reins. Same needs to happen here. Bring on Blomkamp’s effort! Give him total control! Short of burning all copies of the AvP series, films, games, books, etc., and wiping memories – (Yes It’s an extreme stance, I’m being somewhat tongue-in-cheek here.) What is the best way of separating Predator from the Alien universe? I never liked whedon in the first place for various reasons. Even before I heard him say that. I’ve never heard Cameron or Scott really comment on Alien: Resurrection. I know Scott has referred to the director as “the French guy”, but neither have spoken about the movie. Any quotes from either regarding it?